Welcome Back. As much as I like watching football, it’s hard not to be concerned about concussions. It’s not only football, of course. 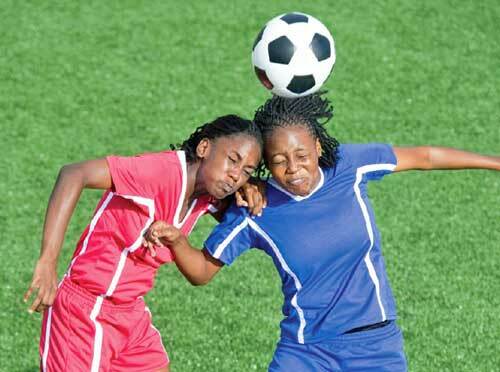 The Centers for Disease Control and Prevention (CDC) lists sports as only one of the leading causes of concussions. Higher on the top-five list are falls, motor vehicle-related injury, unintentionally being struck by or against an obstacle and assaults. Diagnosing a concussion and predicting its duration to ensure the right care can be difficult. But there may be a breakthrough. I’ll begin at the beginning. The Mayo Clinic describes brains as having the consistency of gelatin. Although the brain is cushioned by a fluid inside the skull, a violent blow or sudden acceleration or deceleration can cause it to slide back and forth against the skull. This can result in a mild traumatic brain injury that affects brain function–i.e., a concussion. The effects are usually temporary and might include headaches; problems with concentration, memory, balance, coordination, bright light or loud noise; irritability, sadness, nervousness and changes in sleep pattern; and loss of consciousness. The symptoms can be subtle and may not show up immediately. While most people recover quickly and fully, symptoms can last for days, weeks or longer. 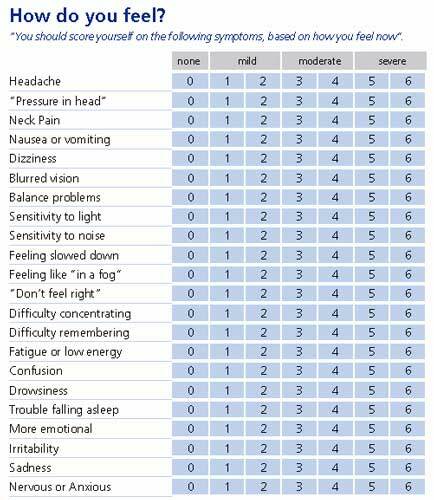 They often last longest for older adults, young children, teens and anyone who had a previous concussion. Concussion diagnosis is a clinical judgment made by a medical professional. Though it may involve a neurological exam, cognitive tests, brain imaging and observation in the hospital or at home, it’s based largely on reporting of symptoms. The Sport Concussion Assessment Tool 3 (SCAT3) is a standardized screening procedure for medical professionals to follow in evaluating injured athletes age 13 and older. Intended for use in the field after injury, SCAT3 was released in 2012 and supersedes two earlier versions. ChildSCAT3 is the corresponding screening procedure for evaluating injured children age 5 to 12. Head trauma is very common in infants and toddlers, yet their inability to express how they feel makes diagnosis challenging. Researchers from the Pennsylvania State University College of Medicine may have come up with an objective approach to diagnosing and predicting the duration of concussions, especially in children. The approach was tested on 52 patients (22 female), average age 14 (7 to 21), who had been clinically diagnosed with concussions. The researchers evaluated each patient with a SCAT3 procedure and parents’ observations within 14 days of the injury, and repeated that evaluation at 4 and 8 weeks. Based on the 4-week evaluation, 30 of the 52 patients had prolonged symptoms. During the initial evaluation, they also collected a sample from each patient. Ready? Here’s the cool part. The sample was saliva, which they analyzed for concentrations of different microRNAs. MicroRNAs (or miRNAs) comprise a novel class of small, non-coding RNAs that regulate gene expression in cells and tissues. Discovered in nematodes (roundworms) in 1993, over 700 microRNAs have been identified and fully sequenced in humans alone; the estimated number in the human genome is over one thousand. Computer models suggest microRNAs influence at least 30% of human genes, affecting diverse aspects of development and physiology. Analyses of microRNA expression are providing valuable information about a number of diseases and injuries, including cancer. 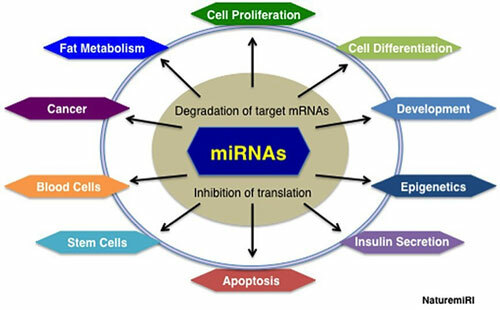 MicroRNAs in development and disease. - 3 microRNAs were associated with specific symptoms--memory difficulty, headaches and fatigue--four weeks after injury. The researchers emphasize that larger scale studies that control for possible confounding factors (e.g., gender, type of injury, predisposing conditions and treatments) are needed to confirm the reliability of their results. Having an accurate, objective approach for diagnosing and managing concussions would be a tremendous advance, more so if the samples were as easy to obtain as saliva. Thanks for stopping by.